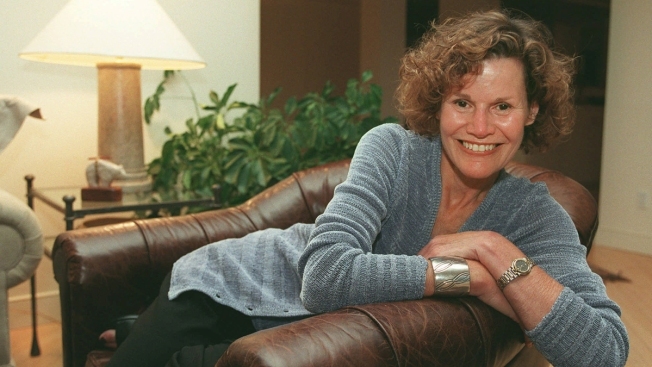 Author Judy Blume poses in her New York apartment May 1, 1998. Author Judy Blume will celebrate the June 2 publication of her latest novel,"In the Unlikely Event," with two Bay Area appearances. Blume is scheduled to appear in conversation with actress Molly Ringwald at the Castro Theatre in San Francisco on June 7. The program, "A Sunday with Judy Blume," is presented by the Commonwealth Club of California. She'll also appear at the Bay Area Book Festival in Berkeley on June 6. The venue has yet to be announced. "In the Unlikely Event" is Blume's first adult novel in 16 years and 28th book release overall. The fictional narrative is centered around a series of airplane crashes that happened over three short months in Elizabeth, NJ in 1951-52, a chain of freak accidents that Blume says she has tried to make sense of ever since. "We were witnessing things that were incomprehensible to us as teenagers," Blume said on her publisher's website Knopf Doubleday, which also reports her total sales as exceeding 85 million. "Was it sabotage? An alien invasion? No one knew, and people were understandably terrified." The book publisher's description notes that readers will see characters "coping not only with grief but with first love, estranged parents, difficult friendships, familial obligations, divorce, career ambitions, a grandparent's love, a widower's hope, and everything in between."